In January 2017, the outgoing Secretary of the U.S. Treasury Jack Lew issued the Financial Report of the U.S. Government for the government’s 2016 fiscal year, which ended on September 30, 2016. In that report, Lew totaled up his estimates of the assets and liabilities of the entire U.S. government. 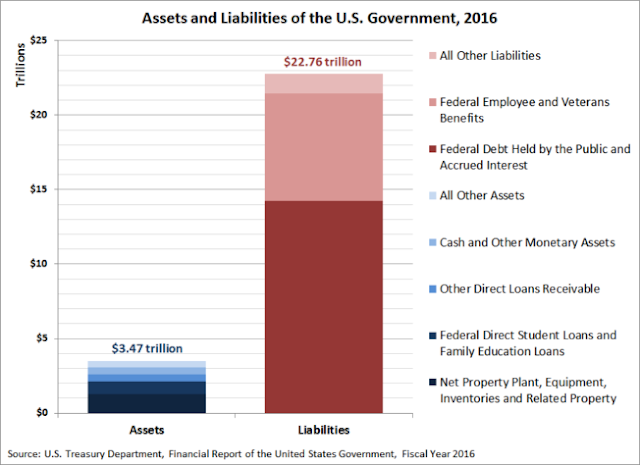 The chart below breaks down the U.S. government’s primary assets and liabilities while visualizing the sheer mismatch between the two sides of the U.S. Treasury’s ledger. In January 2017, the outgoing Secretary of the U.S. Treasury Jack Lew issued the Financial Report of the U.S. Government for the government’s 2016 fiscal year, which ended on September 30, 2016. In that report, Lew totaled up his estimates of the assets and liabilities of the entire U.S. government. The chart below breaks down the U.S. government’s primary assets and liabilities while visualizing the sheer mismatch between the two sides of the U.S. Treasury’s ledger. In the chart, we’ve shown the government’s largest asset as the combination of net Property, Plant, Equipment, Inventories and Related Property that the U.S. government owns, which includes the value of things like federal lands and forests, office buildings and equipment owned by the U.S. military, which accounts for over $1.2 trillion of the nation’s assets. The second largest asset is the combination of Federal Direct Student Loans and Federal Family Education Loans, which together had a face value of $825 billion at the end of the government’s 2016 fiscal year. Other loans, such as those made by the U.S. Departments of Agriculture, Energy and others account for another $490 billion of the U.S. government’s assets. Cash and other monetary assets, like the gold reserve held at Fort Knox, totaled up to $490 billion, and all other assets combined added up to $396.5 billion. All of these assets together added up to some $3.47 trillion. Unfortunately, the value of the U.S. government’s assets are dwarfed by its $22.76 trillion worth of liabilities. Those liabilities are primarily made up of the $14,221 trillion of the U.S. government’s debt that is directly held by the public, which includes foreign nations, and also some $7.2 trillion of benefits promised to employees of the federal government and also to veterans of the nation’s military services. In the chart, we’ve shown the government’s largest asset as the combination of net Property, Plant, Equipment, Inventories and Related Property that the U.S. government owns, which includes the value of things like federal lands and forests, office buildings and equipment owned by the U.S. military, which accounts for over $1.2 trillion of the nation’s assets. The second largest asset is the combination of Federal Direct Student Loans and Federal Family Education Loans, which together had a face value of $825 billion at the end of the government’s 2016 fiscal year. Other loans, such as those made by the U.S. Departments of Agriculture, Energy and others account for another $490 billion of the U.S. government’s assets. Cash and other monetary assets, like the gold reserve held at Fort Knox, totaled up to $490 billion, and all other assets combined added up to $396.5 billion. All of these assets together added up to some $3.47 trillion. Unfortunately, the value of the U.S. government’s assets are dwarfed by its $22.76 trillion worth of liabilities. Those liabilities are primarily made up of the $14,221 trillion of the U.S. government’s debt that is directly held by the public, which includes foreign nations, and also some $7.2 trillion of benefits promised to employees of the federal government and also to veterans of the nation’s military services. Selling off the assets of the U.S. government can be part of the solution but stiffing those who hold U.S. debt and thus directly contribute to out of control government explosion in obligations must also be a part of the solution. If such US government debt holders expected the American people to be saps and stand silent while taxes are raised or Federal Reserve prints more money to pay down the debt, well, tough luck for the debt holders. Let's hope they are stiffed and turn out to be the saps. This is nonsense, to compare assets and liabilities without regard to the future income and obligation streams of the entity or person. Many people with large mortgages have a negative net worth, but their income stream will allow them to eventually pay off the mortgage. And future obligations can also make a strict accounting of assets and current liabilities misleading. While the US govt will never be able to pay off its debts, it does have and will have income, and this ought to be accounted for. Likewise its future obligations, which are enormous. When this is done the above numbers look like inisignificant. Yes, just assume the government has the right to tax away from us whatever it needs to pay its debt. Creep. "While the US govt will NEVER be able to pay off its debts, it does have and will have income, and this ought to be accounted for." The point of the post is that they will default and the REASON is because they don't have the assets or income to pay off their debts, which you readily admit. So your post is immaterial. Excuse me? DId I defend the government's thefts in any way? I only point out how inadequate the above analysis is for getting a true picture (in which unfunded liabilities dwarf everything else). I declare you a non-thinking troll and will not engage you further.